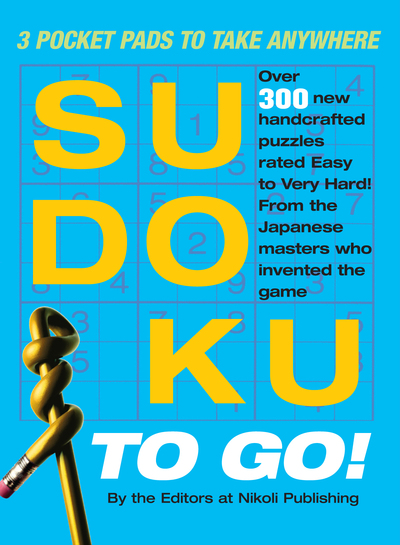 Introducing a new idea in Sudoku, and it starts with travel: SUDOKU TO GO! is a collection of three slim notepads, each the perfect size to stick in a pocket or bag, light enough that you wouldn't even know it's there but convenient enough to pull out and play anywhere-on the train, the bus, plane, or in a restaurant while waiting for an order. Published in the same footprint as Nikoli's wildly successful Original Sudoku series the pads are bound by a wide belly-band. 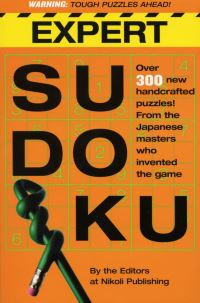 Each pad contains 100 all-new puzzles. The pads are rated Easy/Medium, Medium/Hard, and Hard/Very Hard, making it easy to match the player's mood or available time to play. And because they're from Nikoli, each puzzle is handcrafted by an expert who draws you in with symmetry and elegance, predicts your every move, and adds just enough twists and surprises to challenge you, regardless of the level. It's an experience of play that no computer-generated puzzles can match.